How do you propagate thyme in water? 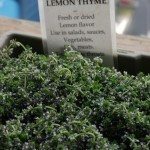 Take a sprig of the thyme that is at least 4" long. Strip the leaves off the bottom half of the sprig. Place this in water. To help keep rot away, mix the water with 1 drop (no more) of bleach to one cup of water. Rooting hormone added to the water or using willow water will help.